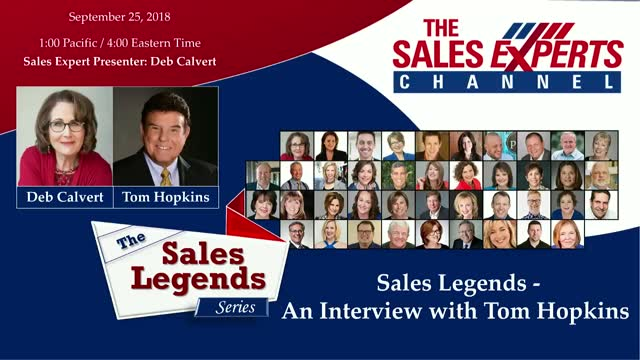 Join Deb Calvert as she interviews Tom Hopkins Tom has earned the reputation of being America’s #1 “How-To” Sales Trainer. Over 5 million salespeople, entrepreneurs, and sales managers on 5 continents have benefited from his live training events. He perfected his selling skills during his 8-year real estate career in which he received numerous awards. In his last year selling real estate, he sold 365 homes – an average of one per day – something that was unheard of at the time and has rarely been matched. Since that time, he has developed and customized his proven-effective selling skills for over 350 companies. He has authored 20 books on the subjects of selling and success. Over 2.9 million copies of those books have been read by sales pros the world over. He is also the 2013 recipient of the Lifetime Achievement Award from the National Academy of Best-Selling Authors. And, he’s been acclaimed as the #1 Sales Guru 2 years in a row by Global Gurus.